All transactions are safe and secure with a reliable history in online purchasing behind each of our associates. 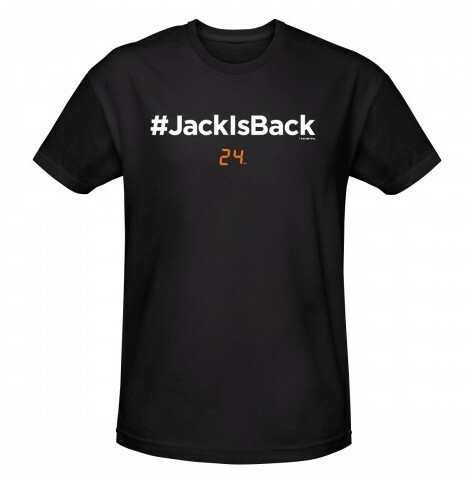 Buy the Jack is Back t-shirt to own 24 clothing and merchandise. The design on the front of this 24 TV show t-shirt displays the 24 TV show logo along with the phrase, "Jack is Back," to celebrate the return of Jack Bauer. The logo is displayed in an orange digital style font. This 24 t-shirt will remind others that killing Jack Bauer doesn't make him dead, just angry. It is available in six different sizes. In addition to the Jack is Back tee above, browse the 24 Clothing Gallery for more apparel like men's and women's clothes, kids shirts or hoodies.